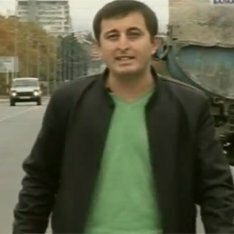 Russian television journalist Kazbek Gekkiyev has been shot dead in the North Caucasus. Kazbek Gekkiyev, 26, was a newsreader on state-controlled local television in the republic of Kabardino-Balkaria. Attacks on journalists have become relatively common in Russia. The North Caucasus is the country’s most volatile region, where security forces are battling an Islamist insurgency. On Thursday morning, the deputy minister of transport of Kabardino-Balkaria was injured in a bomb attack. The official, Vladislav Dyadshenko, was taken to hospital after explosives went off near his car in Nalchik, the capital of the republic. Kazbek Gekkiyev was killed in the same city, as he returned home after an evening programme on Wednesday night. According to witnesses, the journalist was approached on the street by two men. They reportedly checked his name and profession, and then shot him in the head. A spokesman for Russia’s Investigative Committee called it an “outrageous crime that was aimed as a warning to other journalists who report on the fight against bandits”. Human rights groups have complained at the beating or murder of journalists who have tried to uncover wrongdoing by Russian authorities. However, the latest killing did not appear to fit that pattern. Colleagues at the Vesti Kabarda-Balkaria channel said Kazbek Gekkiyev had never pursued any critical reports and mostly delivered official law-enforcement information. His brother Alibek Gekkiyev told Ekho Moskvy radio that his brother was very committed to “being a professional in what he does. He has never done anything bad to anyone, on either side. He was an absolutely neutral man”. The channel said several of its reporters had received death threats from Islamists – but that it had not been part of Kazbek Gekkiyev’s job to cover the Islamist insurgency.